Fried Prawn with Lemon rice is a simple dish combination to prepare for busy days and perfect when you end up with unplanned guests, for you won’t take too long to prepare and fry the prawns and boil the rice. 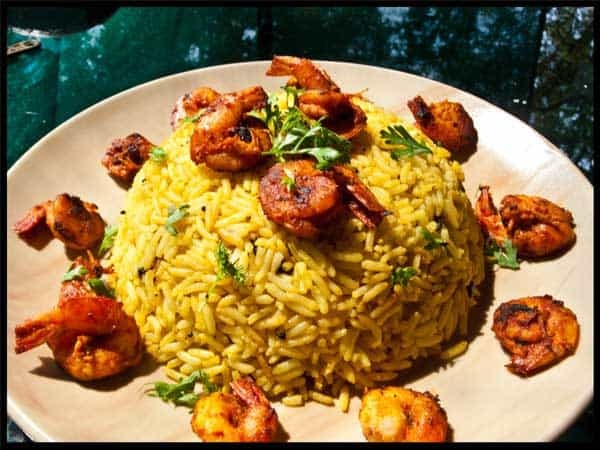 The lemon rice compliments the prawns well and the colors of the spices a full yellow and red. It is an other Indian dish but this time an uncomplicated one. We experienced in Goa some days ago our last rain of the season, at least we think so it was our last rain, well nobody can say for sure. Finally the rain cooled down the insane humid temperatures, leaving the world refreshed and clean. Even the squirrels started to come out more, but they were too fast again to click a photo of them. Anyways, after cleaning and washing the prawns, salt them, not too much please, and add the Garlic Paste. We use garlic paste because the finer the better it can lie in a all over marination for minimum 20 mins. More benefiting then chopped garlic for the flavour. Now get the ready made Red Masala Paste and add 1 1/2 Tbs to the prawns. Mix and marinate well, keeping it lying for 5 mins. Then heat a Frying pan with Oil and add the prawns only if the oil is hot. Once added, fry on high heat for max. 5 mins both sides, juicy. The high heat will reduce the liquids because you don’t want it to boil but fry. Ready to be served hot! You can garnish all that with some chopped Coriander, for the taste and for some extra colore! This looks amazing, I can't wait to try your lemon rice! I've had lemon pasta so this is going to be wonderful! Hola Helena: Acabo de conocer tu blog porque te has hecho seguidora del mío,te agradezco el detalle de quedarte en mi rincón dulce,y con tu permiso me quedo de seguidora de tu blog que me ha encantado.Espectacular las fotos y como cuentas de tus experiencias y de tu vida!Suerte y Felicitaciones! ¡Hola! Gracias por venir y por tus cumplidos. Me gusta tu blog, aunque no entiendo mucho, sus mensajes son interessting y las imágenes son impresionantes. Yo traduje todo lo relacionado con http://translate.google.com/, por favor, perdóname si hay errores en la escritura. Hi, this may be interesting you: Recheado Prawns Goan Stir fry Recipe!